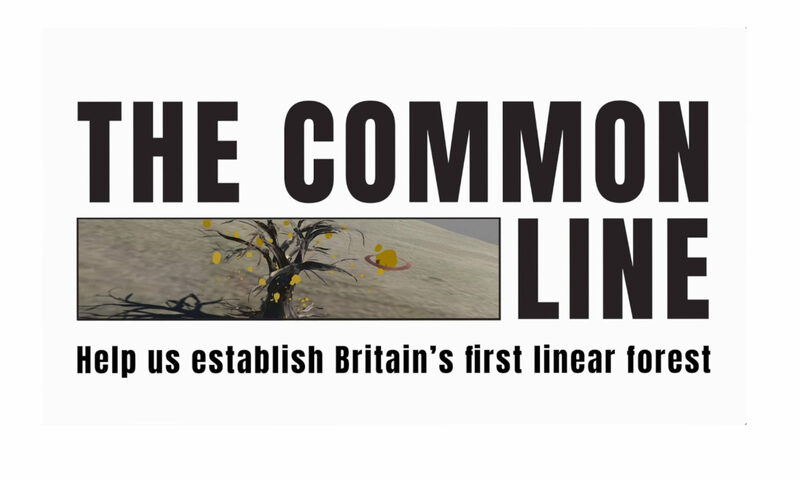 The Common Line is an imaginary feature. Even if we were to succeed in planting it all the way to the horizon, we’ll still have to imagine the rest of it. On our first prototyping day in Rickerby Park, Carlisle, we invited people to experience and comment on different virtual trees that we had ‘planted’ in the park. As our test persons looked though the viewfinders of their mobile phones, our virtual trees would appear within the frame – more or less connected to the spot on which we had placed them. 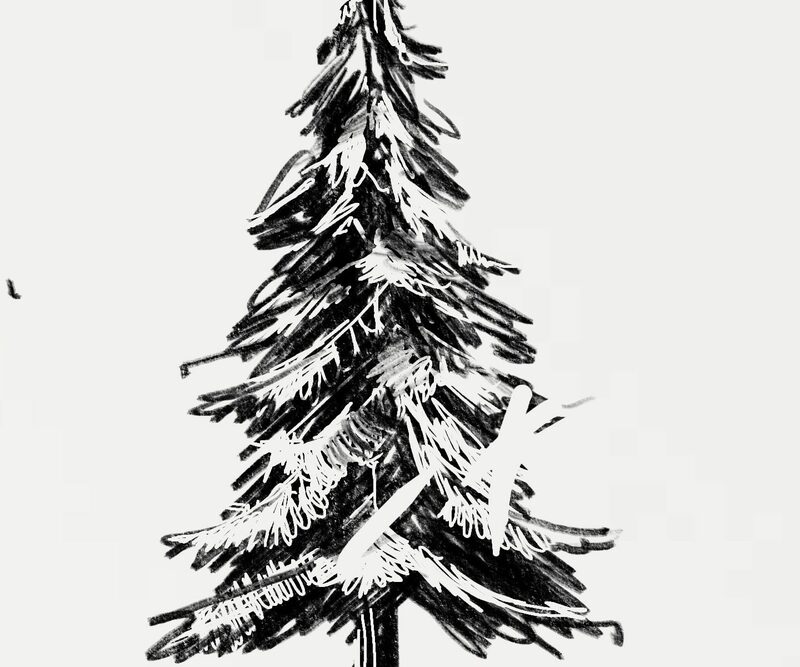 We used two types of images: an ‘off the shelf’ digitally generated 3D tree, sourced from the internet seen above, and several 2D black and white scribbles of trees that I’d drawn. Visitors could experience the 3D tree and its pretense of being ‘real’ from all directions, whereas the 2D trees, flat as paper, would disappear when looked upon from the sides. The backs of these drawings would simply appear as black silhouettes. All of our test audience preferred the hand drawn trees. 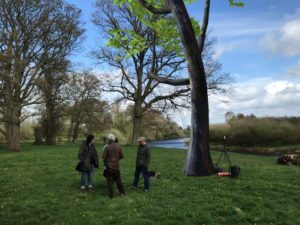 Some felt that the drawings didn’t try to compete with the natural environment in the same way as the VR tree – ‘I don’t need to look at that when I have the real thing next to it’. Like handwriting, the scribbles were perceived as a someone’s personal trace on the land, making for a sense of dialogue and invitation. One visitor found the overtly hand-drawn trees less prescriptive, opening up an imagination rather than closing it down. 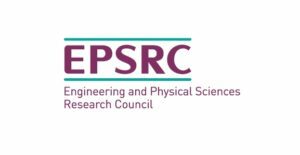 These are significant differences, but whatever the process by which digital trees are generated, I agree with Paula that in the context of our project, they will always serve as uncanny reminders of the absence of living trees. A different kind of uncanny can be found in the uncanny valley phenomenon, which was originally defined as an emotional reaction to human-like objects, such as the cuteness response to cuddly toys with a baby schema. As they get more realistic however, humanoid objects begin to evoke sensations of discomfort or even disgust. This causes a statistical dip in the empathy curve, referred to as the uncanny valley. As the object becomes even more life-like, empathy gradually returns. The phenomenon tends to be explained in evolutionary terms, with repulsion or fear being triggered by instincts of self-preservation. Currently CGI aims to provide ever better likenesses. In terms of the above argument this is gradually unhinging our proven instincts of self-preservation. This raises interesting ethical questions which also affect the digital aesthetics we want to adopt in The Common Line . The uncanny valley experience doesn’t just apply to human like shapes. Immaculate CGI animations advertising urban infrastructure projects quite commonly receive an unpleasantly sterile, uncanny touch in the depiction of plant life in particular. Going by various online specimens, trees still appear to be a veritable challenge to VR designers, and often they are a long shot from even dipping into the uncanny valley in the first place. Drawing is imagining, and two-dimensional representations of the world are always major acts of translation. The artist has to find the shorthands that simulate an entire dimension, and they have to interpret and transcribe its orders. In doing so they create perspectives of meaning that are always a reflection of their very being in the world. How does this relate to our virtual trees and the form they will take in our next prototypes?